Edgar Stead, Robert Wilson and Percy Elworthy visited Ruapuke Island in eastern Foveaux Strait for a day at each end of their stay on nearby Green Island, in Nov-Dec 1941. 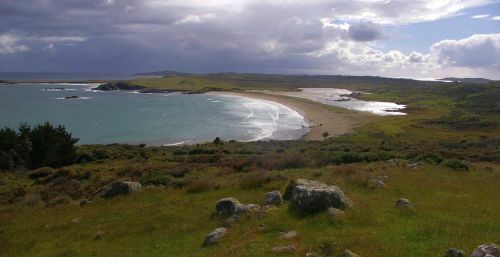 They didn’t have time to explore much of this privately-owned 1600 ha island, with most time spent in the south-east between Old Ruapuke and Henrietta Bay. They did, however, visit the main podocarp / rata / kamahi forest patch in the hope of finding saddlebacks. 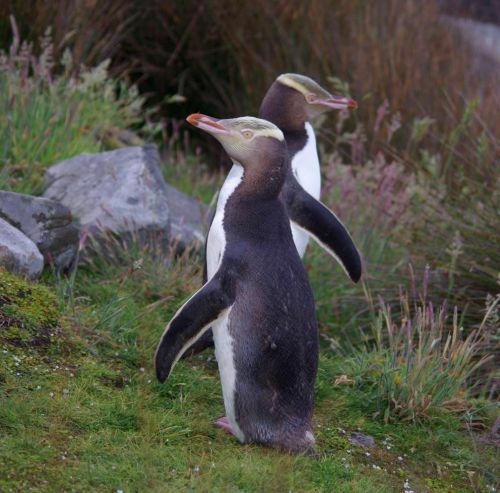 I was privileged to be hosted on Ruapuke Island for 4 days at the very end of 2012, and also to visit Green Island. Forest birds were similar in 1941 and 2012, with bellbirds and tui widespread, and tomtits and red-crowned parakeets in the main forest. The brown creepers that Stead recorded appeared to have died out, but we recorded New Zealand pigeon / kereru, a species overlooked or absent in 1941. The weka on Ruapuke Island are presumed to be Stewart Island stock. They are unusual for Stewart Island weka in having retained both the blackish and red-brown colour morphs. Although we saw more of the brown birds, several mixed pairs were seen, and both birds were black in one pair. The only other weka populations that have the black (or blackish) morph are in Fiordland. We also found both morphs present on nearby Green Island, but with fewer dark birds present. 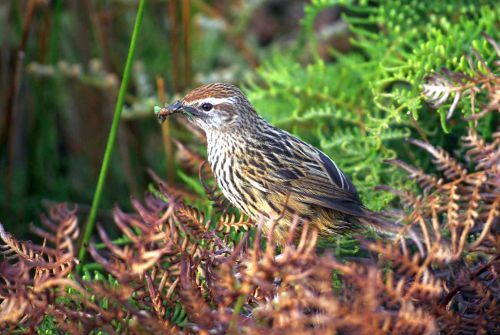 A surprising find in 2012 was that fernbirds were common on Ruapuke Island. Stead did not record fernbirds in 1941, yet they are now present in areas that he visited. It is possible that they have sinced colonised from Bird Island 3 km away, where Stead found them during a brief visit at the end of his trip. Both Ruapuke and Green Islands remain important breeding sites for the rare yellow-eyed penguin. The inaccessibility of the islands to anyone other than landowners is undoubtedly of ongoing benefit to this shy species.